These bollards, meant to block off a portion of the intersection at E. 6th and Waller for pedestrians, quickly took a beating from vehicles. Almost immediately after crews had finished the improvements, however, signs of trouble began to appear on social media. Photographs posted on Twitter showed that the once-proud bollards had been mowed down, wheatlike, by cars and trucks whose drivers failed to negotiate the new, sharper turns. 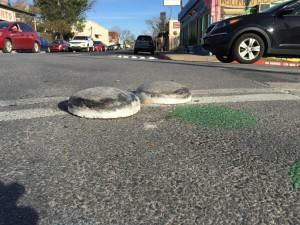 The "turtle shells" that replaced the badly beaten bollards at this East Austin intersection also took some beatings from vehicles, and even got pushed around when their adhesive came loose. ATD staff reacted by going a different route. By March, the badly beaten bollards had been replaced by white “turtle shells” – short, circular protrusions that resemble their reptilian namesake and are affixed to the street surface with a powerful adhesive. Again, though, there was a problem. According to Anna Martin, a traffic engineer with the city, the right type of adhesive had not been selected. Martin told the Austin Monitor on Monday that turtle shells are usually deployed to delineate bike lanes and aren’t generally designed to withstand a steady onslaught of cars and trucks rolling over them. As it happened, soon after the shells were installed, they began to become unfixed from the street until there were only a handful left. The Monitor even snapped a photo of one shell, scuffed and scarred, that had finally found respite from its regular rubber barrage in the grass between curb and sidewalk. Recently, crews went back out and installed new shells, this time using a different adhesive. And acting on a second lesson learned during the course of the project, Martin said, they repositioned the shells slightly closer to the sidewalk to cede back extra turning room previously taken from automobile traffic. A recent photo snapped by the Monitor shows that despite the small inward retreat, some shells are already badly scuffed with tire tracks. Martin noted that the ones in question are on the southwest corner and are more likely to be dinged by large trucks turning off of East Sixth Street to head south on Waller Street. She said heavy truck traffic will likely continue and even expand as work begins on a hotel on the northwest corner of the intersection and as the Capital Metropolitan Transportation Authority’s nearby Plaza Saltillo redevelopment project gears up. 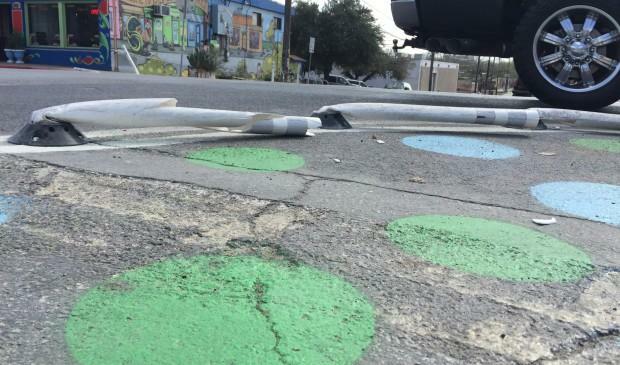 According to the Austin Transportation Department, the polka-dot project’s most recent estimated cost – after the second round of turtle shells – is $3,219.50. Compared to the $30,000 cost of a typical set of concrete bulb-outs – which are physical expansions of sidewalks and curbs into existing streets (and which were installed on South Congress Avenue a few years ago) – the project has clear financial advantages. Both Krause and Martin described the Sixth-and-Waller work as a pilot project and added that Transportation Department staff is still studying its outcomes. Martin said that plans are underway on a similar project at Tillery Street and Govalle Avenue, also in East Austin. That intersection, she said, is in line for a four-way stop and also concrete bulb-outs. Martin said those bulb-outs could also be painted with a lively design, though she added that polka dots are probably off the list of possibilities.